FSX/P3D Boeing WB-50D Weather/Recce Superfortress model and textures WB-50D (s/n 90285) has no gun turrets and comes in MATS arctic markings. Previous installation of Team 50's Boeing_B-50V1.zip required. By Manfred Jahn. FSX/P3D Boeing B-50 V.1 The Boeing B-50 Superfortress was a post-WWII derivative of the B-29 Superfortress. It had a larger tail fin and more powerful 3,500 h.p. Pratt & Whitney Wasp Major engines. In the simulator you can fly the aircraft either as an 'A' type (using a B-29 type glass cone) or as a 'D' (and later) type, both with or without long-range tanks. Created by 'Team 50' - models and textures by Manfred Jahn, sound set by Ted Wolfgang, research, testing and tweaking by Marc Roth. The flight dynamics are based on the 'generic' C-97 design by Wayne Tudor. Some small issues aside, the plane is flyable in P3D V4, too. Gloster Sea Gladiator, Thicko's original model now updated with Yiannis Katehis Tsetsas superb VC panel and his gun & exhaust effects. I also put in Rob Barendrechts catapult gauge for carrier starts. All credits go to Thicko for his still great model, to Yiannis who gave me permission for using his superb "stuff" and to Rob for his still wonderful gauges. Hats off to these guys who keep flightsimming alive. Safe landings! The Fairchild 91 was a single-engine eight-passenger flying boat airliner developed in the United States in the mid-1930s. Fairchild designed the aircraft in response to a Pan American Airways request for a small flying boat to operate on their river routes along the Amazon and Yangtze. The result was a conventional high-wing cantilever monoplane with its radial engine mounted above the wing in a streamlined nacelle. The red "Kono" belonged to explorer Richard Archbold. This an FSX update of the fs2004 F-91 by Chris Herring. The package features entirely revised panels and includes the three default and three new liveries by other authors. Smoke and additional camera views (cabin and co-pilot) added. FDE optimized for FSX. All credits go to Chris Herring for the original model, new panels and other updates by Michael Pook. 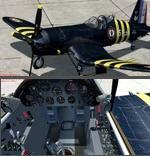 FSX/P3D 3/4 Chance Vought F4U-7 Corsair package. Liveries include US Marines, Blacksheep, VMA, VMF, French Navy, Royal Navy. 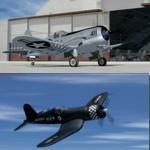 The Vought F4U Corsair is an American combat aircraft that made it's name in World War 2 and Korea. The aircraft was so popular that Vought was unable to meet demand and called in additional manufacturing by Goodyear and Brewster. Original fantastic ALPHA BLEU CIEL model converted to FSX native format by LLS. VC converted to FSX native with P3D v4 panel adaption by Chris Evans using gauges from Milton Shupe. Tested in Prepar3D V4 and 3.4 and should be OK also in FSX. Zip preview for images. Assembled for FSX Acceleration and P3D 3 & 4 by Chris Evans. Junkers Ju-52/3m China Eurasia NO.17 package Model by O.Fischer, featuring detailed virtual cockpit, 2d panel and sound. Textures by Liao Yitong. Works in FSX and P3D up to V3 (not v4). The Beechcraft AT-11 for FSX Native v1.0 Models by Milton Shupe, panel and gauges by Scott Thomas, textures by the late Damian Radice, and Sounds by Nigel Richards. Four models and ten textures included. Damian's Paint kit is available at SOH and Flightsim.